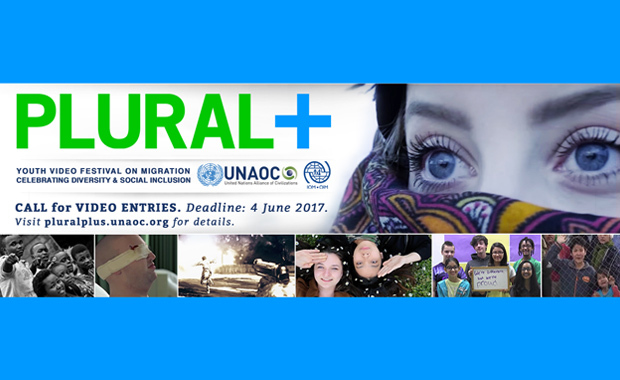 The United Nations Alliance of Civilizations (UNAOC) and the International Organization for Migration (IOM) invite youth from around the world to submit original and creative videos for the PLURAL+ Youth Video Festival 2017. The festival is focused on migration, diversity and social inclusion. Each year since 2009, a prestigious international jury selects three PLURAL+ International Jury Award winners in each age category (up to 12, 13-17, 18-25). The International Jury Award winners will receive $1,000 as well as be invited to New York, all travel expenses paid, to present their work at the PLURAL+ 2017 Festival Awards Ceremony at the Paley Center for Media and possibly as well at the United Nations Headquarters in Fall 2017.